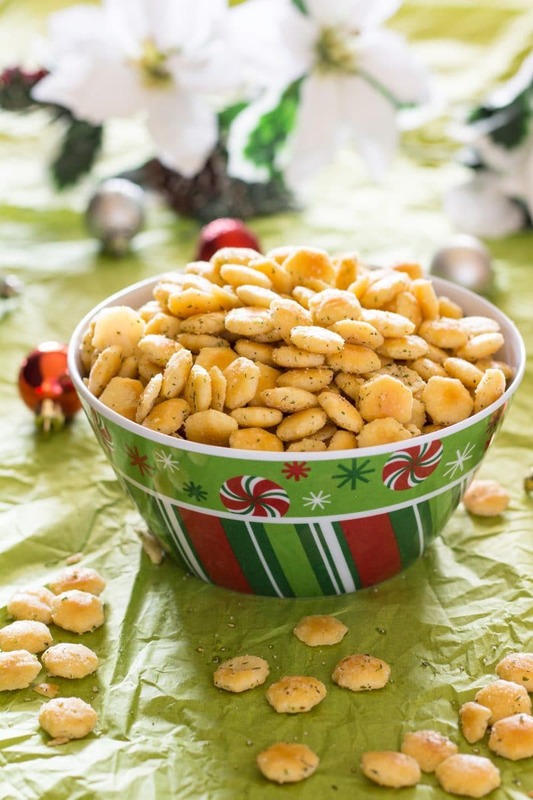 Spiced Ranch Oyster Crackers Recipe is perfect for holiday gift giving and snacking. Add them to your tomato soup for an extra special treat! 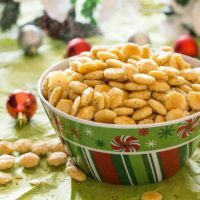 Spiced ranch oyster crackers have many versions and many names across the cooking blogosphere and home kitchens. Our Spiced Ranch Oyster Crackers Recipe is spiced with ranch, extra dill, and lemon-pepper for just a touch of tang. These are probably called crack crackers more than any other name in my house. But, these are good anytime and I didn’t want to banish them to other people’s houses just during the holiday season. These crackers are very easy to make and definitely more frugal than anything loaded with chocolate or nuts. 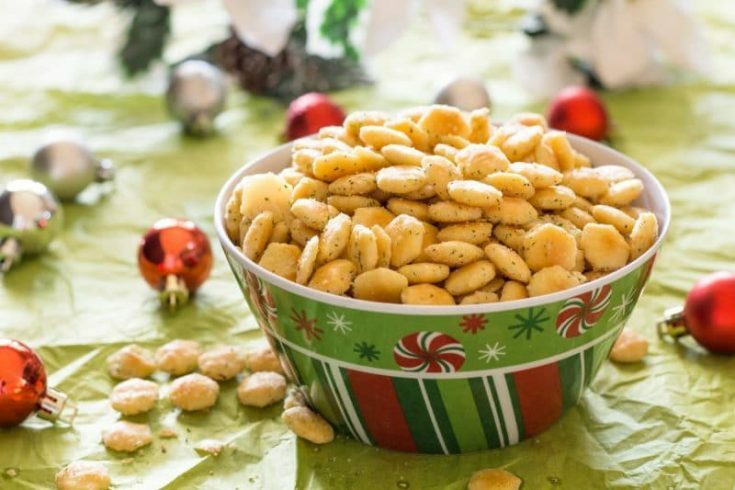 Packed into small holiday bags, these spiced ranch oyster crackers make a great filler for a cookie tray that has a small space left and you are out of cookie cooking or candy making steam. Larger containers of spiced crackers can work as a stand-alone hostess gift. I have used these crackers for both purposes. We also have a friend who tries to eat fairly healthy and this is the only thing she likes to have delivered from our vast array of holiday treats. She adds them to her warm tomato soup as a treat during the holiday season. We have tried it her way, and it defiantly adds flavor to tomato soup! Feel free to omit the lemon-pepper in the recipe if you do not like it. Add cayenne pepper or anything you think might go with the flavors. As with all of our recipes, we encourage you to make it your own by changing things up a bit to match your flavor preferences. If you are brand new to a novice cook and are not comfortable with changing things up, start with this recipe exactly. They are how I usually make them and rarely do I hear any complaints. There are some ranch oyster cracker recipes out there that do not use the oven. We think that those are a little too oily. Baking the crackers in a low 250 Degree F oven bakes the flavors into the crackers rather than waiting for it to absorb into the crackers. Additionally, baking these crack crackers give them a little more crispness. We believe it allows for longer storage before they go soft and stale. With all of that being said, if you want to skip the baking step they will still be delicious, just not as crisp. Give unbaked ranch oyster crackers a bit of time to absorb the oil. It generally takes at least a day or two for all of the oil to absorb. Baking your spiced ranch oyster crackers will have them ready for eating so much quicker. You can be eating them in under an hour. In a large mixing bowl, add all ingredients except the oyster crackers. Mix the crackers a few times while waiting for the oven to preheat. Once the oven is preheated, pour into a baking pan and spread into an even layer. Set the bowl aside without washing the bowl. Remove from oven and stir, making sure to mix back in any oil or spices on the bottom of the pan. Pour crackers back into original mixing bowl and stir well to pick up any spices or oil left in the bowl. Once crackers are completely cooled, place into an airtight container. Any light tasting cooking oil will work, even melted coconut oil.